History recalls how in late November 1957, with the occasion of the Annual General Meeting of Brands Hatch Circuit Ltd, a Director of the Company, by the name of Ken Gregory, and a shareholder of the firm, named Alfred Moss, had a conversation about what they intended to do in the immediate future. What they agreed there was the origin of a very curious Formula One team that lasted until 1964. Ken Gregory had been acting as Stirling Moss' manager for some years whilst Alfred Moss had been the father of Stirling for almost four times that period. They both had been surrounding the future Sir since his F3 days, but now, with Vanwall and Aston Martin having their own efficient organizations looking largely after Stirling, there was little they could do to contribute to his success. Both were probably feeling that they were, by now, somewhat superfluous but also realized that they had learnt a great deal about racing through the years, could apply their experience and spend their energies in running their own racing car. From a business point of view, they were not expecting to make huge profits, but they both shared the idea that a racing car could be run properly without showing a loss at the end of the year. And they probably also thought it would be fun. And so they created the British Racing Partnership. History recalls too that the agreement consisted on Alfred Moss putting up the money and Ken Gregory committing to manage the team. Alfred Moss had a bit of space available on his farm at Tring, and, logically, the BRP was based there. One of the outbuildings served as a spacious garage, and they partitioned off sufficient space to establish an entirely separate workshop in which to prepare the car when it arrived. The first car was going to be a Formula 2 Cooper, and they met with Charles Cooper to order it. If one takes a look at the Cooper chassis records, car F2-10-58 with engine FPF 1041 was bought in the name of K Gregory, his name found in the list in close company with other buyers who, even today, excite our imagination: R Walker, R Parnell, B McLaren, J Brabham. The next important thing to do, once accommodation and car had been dealt with, was staff. The choice of Tony Robinson as chief mechanic was somehow logical, as Robinson had been with Stirling Moss since 1953, and was a patient and perfectionist mechanic very much appreciated by Gregory and Moss. Robinson was working at the time with Bruce Halford, but found the BRP proposal more exciting. The last item in the equation was the choice of a driver, and it seems that they had no doubt that a young member of the Vanwall team, named Stuart Lewis-Evans, was the perfect choice. As Stuart's Vanwall commitments meant that he could not always drive for the BRP, they had to choose a second driver as well: a sort of "trainee" that would drive the Cooper when Stuart was engaged elsewhere. A short-list was made out of F3's talented young men, and Tommy Bridger, who had been battling with F3 "kings" Don Parker and Jim Russell in impeccable style, was the chosen one. With Stirling Moss' F1 campaign for 1958 in the hands of Vanwall - and driving for Rob Walker in those events where Vanwall would not send cars - the BRP started his maiden season with an excellent fourth place by Lewis-Evans in the Lavant Cup. Some other good finishes were collected, but the year 1958 ended up in shock with Lewis-Evans' death in Casablanca and the Vanwall's subsequent withdrawal from Formula One (leaving Moss without a drive in a works team). For 1959 the BRP decided to run two cars instead of one, and at the same time they took the view that the Borgward engines were an interesting alternative to the Climax units. In order to attract the interest of the German firm, Gregory offered that Stirling Moss would drive another F2 Cooper with the Borgward engine, although under Rob Walker management. Drivers for the season were Ivor Bueb and George Wicken, but by mid-season Wicken had been substituted by Chris Bristow whilst poor Ivor Bueb died after an unfortunate accident at Clermont Ferrand. Also during 1959, and by means of Robinson's management role with Moss, a F1 BRM P25 was loaned to the BRP in order to have Moss driving it in events where he judged the Rob Walker's Cooper as not suitable. Painted pale-green (as the F2 cars) Moss drove this BRP-entered BRM in the French and British Grand Prix and then, in Germany, at the insistence of the A.v.D, the car was driven by Hans Herrmann. 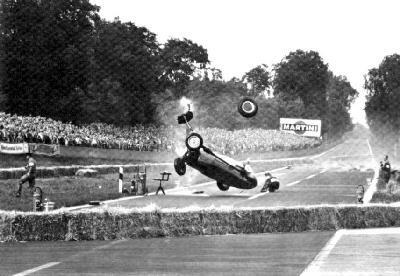 We all remember what happened, after the BRM had a brake failure approaching the South Turn. The car charged through some straw bales, turning six or seven times end over end. Herrmann was very luckily thrown out and suffered only superficial injuries, but the BRM bowled along the road like a mad thing and was completely and utterly destroyed in one of the most spectacular accidents ever to happen in Grand Prix racing. Then, by the end of 1959, Gregory entered into discussion with one of Britain's leading hire-purchase finance houses, a company called Yeoman Credit Ltd., property of three brothers, William, Paul and Fabian Samego-Turner, all of whom were extremely keen on motor-racing. Gregory was able to convince them into funding the jump of the British Racing Partnership to Formula One. With finance secured, the Yeoman Credit Racing Team was born, an organisation that would run cars in both Formula One and F2 races, with the Samego-Turners paying the bills and the BRP entirely responsible for the management and operation of the team. In return, the Samego-Turners would keep the trophies. Chris Bristow was retained as number two driver whilst Harry Schell was the appointed number one. Unfortunately, the mercurial and vastly experienced Franco-American was to have a very short career with the team, as he crashed fatally whilst practising for the International Trophy when driving one of the team's Coopers. The Samego-Turners were quite upset, but they authorised the buying of a third car and Tony Brooks was drafted in to replace Schell. The third car was driven at times by Jack Sears, Henry Taylor and Bruce Halford (delighted to get reacquainted with the best mechanic he had ever had). For the Belgian Grand Prix, Olivier Gendebien was hired. We all remember the tragic events over that weekend and, back in Britain, Ken Gregory had a meeting with the Samego-Turners in which they pointed out that three drivers killed in less than one year (Bueb, Schell and Bristow) was not exactly what they had in mind. The season continued, but it was clear that relations between the partners were degrading simply too fast. By the end of the year, the Samego brothers approached Reg Parnell in order to offer him the running of the Yeoman Credit Team. We know he said yes. Ken Gregory then turned to Colin Chapman for a supply of cars (three Lotus 18s, three Lotus 19s and an Elite) and the Lotus-BRP relation just got under way. The arrangements made with UDT-Laystall were very similar to those agreed with Yeoman Credit, only this time over a period of two years. During 1961 Henry Taylor and Cliff Allison drove for the team, occasionally reinforced by Stirling Moss and Masten Gregory. Not a bad season in financial terms, although the results were mixed. For 1962 the team was re-equipped with Lotus 24s for Grand Prix, whilst they kept the Lotus 19s. With both Taylor and Allison having decided to retire from racing, Gregory signed Innes Ireland, who had been ignominiously sacked by Chapman after delivering Lotus' first Grand Prix win at Watkins Glen. Ireland was to be supported by Masten Gregory in Formula One. Apart from a win in the Crystal Palace Trophy, Ireland's season was pretty miserable, as was his teammate's. So here came the end of the 1962 season, BRP had again lost its sponsor, and had to rethink its strategy. With Lotus having made clear that nobody but the works was going to take delivery of the monocoque Lotus 25 (that had given Clark second place in the '62 championship and was going to help him win the '63 title), the people at BRP decided that Tony Robinson should become a designer. Hence the BRP 1/63 car was born, a car that has always been accused of actually being a clone of the Lotus 24. Some deeper investigation proves that this was not the case, but it looks like it's a bit too late to restore that view now. Second time out, at Zandvoort (our picture), Ireland brought the car home fourth, to the surprise of many. Robinson was pretty pleased, as getting points with a car almost out of the box was an exceptional performance. Ireland was also delighted, even convinced the BRM engines they had were down on power against the works units. With a podium finish at Solitude and another fourth place at Monza, for the Italian Grand Prix, as highlights of the season, the year ended. A very complicated scenario was developing during that year and the following one, which included Stirling Moss getting involved in the company, Ken Robinson losing interest, and the Formula One Constructors' Associations being created. This last move was obviously generated by the escalating costs and technology advances, that were not being supported by sponsors, but just by the constructors themselves. So an organisation became a need, and the constructors decided that it would be a wise idea to negotiate the starting fees with the race organisers as a group. Looks pretty obvious, today. Whilst all these ingredients were being cooked, the team produced a second monocoque, car 2/64, whilst Ireland drove the original car 1/63 to victory in the season opener at Snetterton (the supporting Formula 3 race was dominated by a complete newcomer driving one of Ken Tyrrell's Coopers, a young man called Jackie Stewart). It was run under miserable conditions, for pouring rain was mixed with sleet, wind and heavy mist. A third place at the Mediterranean Grand Prix, and points for fifth place in both the Austrian and Italian GPs was the luggage they obtained. The bad news for BRP was that, incredibly, when they submitted their application to join the FOCA, it was rejected! The reason given was that BRP did not manufacture enough of their own components to qualify as constructors. It was inaccurate, but with just Cooper and Brabham on their side, there was not a lot BRP could do. Ferrari and Lotus were against, and BRM eventually agreed with their view. In a very last and desperate move, the BRP team offered their cars for inspection after the Mexican Grand Prix 1964. It is reported that nobody from the Association even bothered to come to see them. Exit British Racing Partnership from Formula One, and into Indy Racing for a final adventure (which we will leave to be). Innes Ireland's career and personality are too captivating for us to just dedicate a few words to him. So read on here. Second time out and already well within the points. Innes Ireland had qualified his new BRP a good seventh on the grid for the Dutch Grand Prix, which seemed to be one of his favoured tracks. He finished the race In Zandvoort with the same result on fourth place as he did back in 1959, at his first start in a championship GP, for Team Lotus in a Mark 16-Climax. Clark, in this 1963 race, with his milestone Lotus 25 lapped the whole field, Gurney and Surtees finished in second and third place. Ireland took profit of retiring Graham Hill and Jack Brabhams accident after 68 laps and drove his 1.5 V8 BRM powered car home ahead of the remaining works BRM of Richie Ginther and the only Ferrari in the field, Ludovico Scarfiotti. In the first race with the BRP earlier in Spa, Ireland had to retire after 9 laps with gear linkage problems. After Zandvoort, the GP in France brought no better result than 9th place for him and the team. The grid for the British Grand Prix at Silverstone saw Ireland who had qualified 11th and his Team mate at BRP Trevor Taylor, also an ex-Lotus works driver, next to each other. Their internal competition led to a push start and both earned a DQ. Monza was the last appearance for BRP that year. Again, Innes Ireland drove home from again 11th place in qualifying to 4th place to win him another 3 points for the championship, although classified two laps behind the winner and not running. BRP stood for the British Racing Partnership of Alfred Moss and Ken Gregory. The team was initially formed to run cars for Stirling Moss and first appeared on the race tracks in 1959 with two F2 Cooper-Borgwards and an F1 BRM. The latter was driven by Moss in two occassions only, it was later destroyed in the horrible accident of Hans Herrman on the Berlin Avus. After this the team still ran Coopers and UDT Laystall Lotus 24s, without great success. For the 1963 season it was decided to built an own F1 car. Looking at the photos of the car one could assume a Lotus 25 in white colour. In fact, is was a clear copy of this revolutionary monotub of Colin Chapman. Drawn by Tony Robinson the BRP took advantage of the new Lotus feature and it is said that the only difference apart from the BRM engine (the Lotuses were driven by Climax engines) and the Colotti gearbox (Lotus ZF) was its thicker tub. BRP ran two cars in the 1963 and 1964 championship GPs with Innes Ireland and Trevor Taylor. After finishing a joint 9th in the '63 championship, Ireland scored another two 5th places in the '64 season in Austria and again, Monza. Trevor Tayler had been with Lotus in their first season (1962) with the new 25 but, being clearly number two behind Jim Clark he had a poor year although winning the Natal GP. Taylor's single point for team BRP came from a 6th place in USA in 1964. After an unsuccessful attempt to Indianapolis in 1965 and an F1 project failing for the 1966 season, BRP closed down. The only important win of BRPs own design was the 1964 non-championship Daily Mirror Trophy at Snetterton, secured by Innes Ireland. To make the BRP 63/1 stronger than a Lotus could well have been initiated by Innes Ireland himself. The former Lotus works pilot had won his first GP in 1961. At Watkins Glen, the first race after von Trips tragic death at Monza he took the chequered flag first time for himself but also first time for Team Lotus and Colin Chapman. (Stirling Moss had won the first Championship GP in a Lotus 18, but for the Rob Walker Team.) Ferrari did not come to the US GP, partly in respect for von Trips and partly because Phil Hill had already secured the World Championship for himself with his victory in the Monza race. Ireland withstood the competition of the Porsches and Coopers and secured not only the Lotus 21s only victory but also Teams runner up position in the 1961 constructors championship behind the more powerful Ferrari 156s. As was Ireland, Chapman was very happy about this first big success for the Team. Innes Ireland at this time still felt he was a better driver than rising star Jim Clark and had no doubt about a good 1962 season with Team Lotus and the new 24 plus the 25 already on the drawing board. However he learnt a bitter experience from Chapman who fired him right away on the London Motor Show in Oktober 1961, only weeks after his historic victory! The reason for this move lay partly in the past and partly in the future. Certainly, Chapman had discovered that his number one would be Jim Clark, without doubt. Jim had shown his potential in the past season, wheras Ireland, had he not had scored victory in the US GP, only came up with 3 points from his 4th place in France. Admittedly, he had to pause after a Monaco accident, being replaced by young Team Lotus Formula Junior driver Trevor Taylor, who showed some promising potential. Ireland would be to expensive for Chapman in the time to come, because his price money had risen from 25 to 50% in 1961. Other reasons may have been in Ireland's character. Clark's fellow Scotsman could get embarrasingly drunk. After his victory in the non-championship race at the Solitude the same year 1961 it was reported that he had very specially celebrated in his hotel, shooting with a gun into the ceiling. The incident was later clarified. Another journalist had let off a string of fire crackers. However, the story fits with Ireland's image at the time, the son of a Kirkudbright vet who was a paratrooper during his military service in Egypt. Other than Clark, Ireland would also complain about the strength of Lotus Cars and their vital parts, a point at which Chapman was very sensible: "I trusted in Colin and his talent. I did not race for myself, I gave it all for Lotus. When people told me to leave Lotus and join BRM because I was going to kill myself with Lotus, I stayed. Only in 1959 I had brake failures four times. In Rouen my race ended 50 meters down in a gorge. But I thought, if I leave Colin, he would not have anybody. My dismissal came like a knock-down. He (Chapman) destroyed much in my life. It was the worst I have ever experienced." 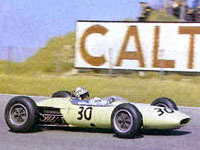 Ireland raced Laystall-Lotus 24s in the 1962 season. He did never ever forgive Jim Clark, nor for a very long time Colin Chapman: "When Clark and Chapman were standing together and I passed by, they stopped talking and watched me from the corners of their eyes." The victory with the BRP in the Daily Mirror Trophy was his last. After the BRP project was stopped he drove a Parnell-Lotus BRM in 1965 and only two more GPs in 1966 in a Bernhard White BRM. He hung up a his distinctive chequerboard pattern helmet and started writing for Road and Track as well as GP reports for Autosport. In Zeltweg/Austria 1982 Elio de Angelis won a very close GP from Keke Rosberg. It took until then, more than twenty years after the historic first GP win for Lotus, that Chapman and Ireland talked to each other again. It was also the last GP win which Chapman could celebrate. Innes Ireland died in 1993 from cancer, at the age of only 63. In his last year he was president of the BRDA.